COMMENTS: This is an OLD article, written in January 1985, based on a ride that took place December 1984. I wouldn't be surprised if there are McDonald's on the roadsides by now. So this sincere writeup is probably not very useful for this particular route. But perhaps it can be useful for riders planning their own "adventure" rides, be those rides in eastern Turkey or Afganistan. 1 Prices drop dramatically as you leave the northern European countries. In the Netherlands and Sweden I ate bread and cheese, in Yugoslavia and Turkey I ate shish kebobs and stew, sometimes even enjoying a cognac after dinner. 2 As a bike-tourer you are more of a novelty in the less-traveled countries--people will go out of their way to show you around and even feed and house you. The high-lights of my trip were not seeing the museums and monuments but rather visiting the workplaces and homes of people that I met. I was introduced to Solidarity activists while in Poland; I toured an olive oil factory while in Greece. These are the memories that count. Water: I met travelers who drank the water; I met travelers who didn't drink the water. One can carry iodine or chlorine, or simply do what I did, which was to buy the 1liter jugs of bottled water, expensive by Turkish standards at 25 cents/jug. Food: I didn't buy pasteries and other snacks from street carts only because of some perhaps overly paranoid article I remember reading which suggested avoiding this fare. Instead I ate in local restaurants, which were very affordable. Seasonality: I went in December and was cold. Think carefully about going in the middle of the summer, however, I hear it gets hot! Safety: I had no real problems during my trip, but I'll mention a few things. Since I was carrying a bicycle lock I used it. Always. My panniers were the types with zippers, each with a cheap padlock. When leaving my gear in a hotel, lower deck of a ferry, etc. I locked all of my panniers to each other, then to the bike. My gear was never tampered with, that I know of. On two occasions in Turkey new-found friends wanted to "keep me company" at night, a problem that only happened because I was traveling alone. I made it a point to forget the name of my hotel if someone asked. I did not sleep outside in Turkey, and various publications including Lets Go Europe warn against it. At 50 cents-$2.00 a night, sleeping inside made sense (though I don't think it was ever any warmer than outside). Terrain: Flat with easy hills, except for stretches of climbing between Edrimier and Balikesir. Road Surface: Better than reported, but some stretches of rough asphalt. Distance/Day: 32-112 kilometers, depending on distance to next town likely to have an off-season hotel. Total Miles in Turkey: 500+. 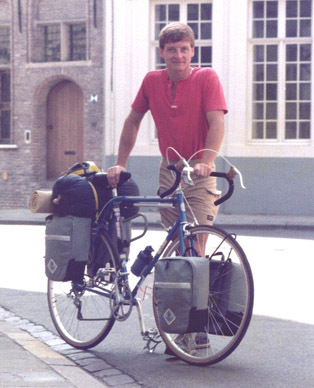 The start of this trip: July 6, 1984, in Belgium. Links to this site are welcome. Copying content or images from this site without written permission is illegal, and uncool.